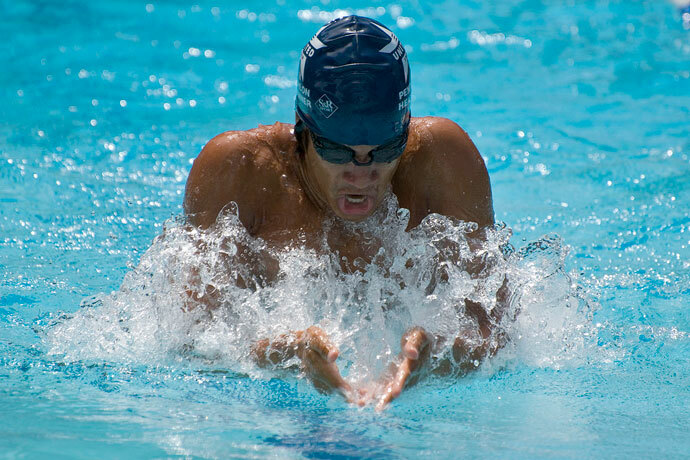 The breaststroke is without a doubt one of the most popular swimming strokes. In fact, many recreational swimmers are perfectly happy using this swimming stroke all the time. Because it is so popular, we consider it as one of the basic swimming strokes. The breaststroke is the one of the most popular swim strokes. The breaststroke is swum in a prone position. Both arms move synchronously and execute short, half-circular movements underwater. The legs also move synchronously and execute a whip kick. This video shows above water and underwater footage of a professional swimmer which is swimming breaststroke. 1) In the initial position, you float in a horizontal position on your chest. Your arms are held together and extended forward, palms facing down. Your head is in line with your trunk, and you look down. Your legs are held together, and your feet are pointed. 2) Now the active phase of the arms begins. Your palms turn outwards, your arms move apart and your body moves into a Y-like position. 3) When your arms are outside of your shoulders, your elbows flex and your hands continue to move back, but also downwards. 4) Once your hands have moved past your shoulders, they move back and inward, until they meet in front of your chest (insweep). This is the propulsive phase of the armstroke. 5) As your hands move towards each other, your head and shoulders rise above the water. Your knees flex, and your feet start to recover towards your buttocks. 6) Your upper body is at its highest point when your hands meet in front of your chest. Your arms start to move forward immediately for the recovery, while your feet continue to move towards your buttocks. 7) As your arms recover forward, your legs end their recovery with the feet being close to the buttocks. 8) Now the propulsive phase of the legs begins. Your feet kick back and apart while your arms extend completely under water, and your chest and head drop back into the water. 9) Once your legs are completely extended, they are brought together. You then glide for a short while into this position. 10) You start a new breaststroke cycle once the momentum of the glide fades. When swum swiftly breaststroke can burn quite a few calories. Head and Body Positions: This article describes how you should position your head and body while swimming breaststroke. This is important if you want to develop an efficient swim stroke but also if you want to avoid neck injuries. 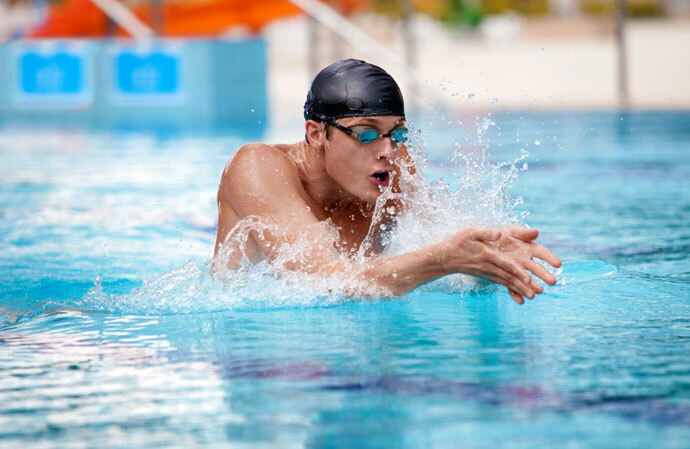 Breaststroke Arm Movements: This article describes the arm movements in more detail. A slow-motion video of correct arm movements is shown and various arm speeds are discussed. The Breaststroke Kick: This article covers the breaststroke’s whip kick. The different phases of the kick are explained and illustrated with a slow-motion video. 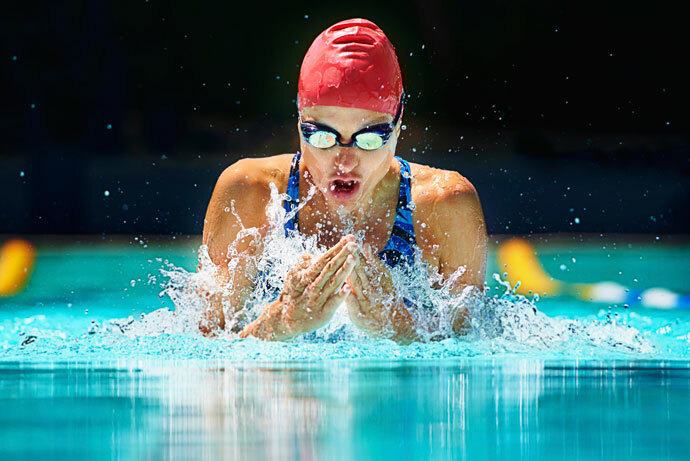 Additional tips to learn the breaststroke kick are given. Breaststroke Swimming and Breathing: This article explains how and when to breathe while swimming breaststroke. It covers both the style where the head is submerged in each stroke cycle and the style where the head is kept above water at all times. In the beginning, the arm movements, leg movements, and breathing exercises are practiced individually on dry land. After this, the different movements are practiced separately in the water, using pull buoys and water noodles to provide additional buoyancy. Subsequently, all movements of the swim stroke are practiced at the same time in the water, again using swim noodles and pull buoys. Finally, once you feel confident enough you graduate to swimming breaststroke without swimming aids. To improve the level of their performances, international swimmers should do plyometrics, circuit and weight training. Then they should be able to achieve their goals. Wow, this really taught me a lot. I must say when I go to swim class I will do well on my 2nd day. Yip yeeh hurrah, there not enough words in my mouth to say and to thank you. I come back to learn the front crawl stroke. Adios amigos en la manana! Well, I still have some difficulties. You see, I still can’t do this stroke. Without seeing you swim it is difficult to identify the culprit. Could a friend shoot a video of you swimming breaststroke and then post it for example on Youtube so we can have a look? I think you just have to push harder. Extend your body and use all your strength to use your arms to push back and to give your legs support. At last, I feel as if I am making progress and now feel more comfortable in the water. I have a problem with step five. I know I have to lift my chest and shoulders, I’ve also seen many swimmers do it but when I’m in the water I just can’t. At the beginning of the half-circular recovery of the hands to the chest, you push downward with your palms against the water. This helps to raise your torso. Your question isn’t very clear. Could you clarify it? Thanks. Again, thank you for this wonderful website. It’s now my bible to learn swimming. I don’t use any other resource anymore. I’m learning breaststroke. There is a specific point that appears to be confusing – when does the legs recovery begin in relation to hands movement? As per this article it seems the legs recovery start as soon as arms’ sweep-in starts -> when arms’ in-sweep completes the legs’ recovery should also be complete -> when my head and shoulders are out of water then my hands are under my chest and legs just above buttocks. Refer to #3 in article above. 1. Am I reading the instructions correctly? Or, am I mis-interpreting anything? If I’m reading these instructions correctly then it seems the two instructions are different. Is it correct? 2. If indeed, two instructions are different which one should be followed? I would imagine the one on this article should be followed i.e. the legs should have recovered and be above buttocks when arms’ insweep ends. Good catch. The leg recovery starts at the end of the propulsive phase of the arm stroke, which for most people is at the end of the insweep. So the article you linked to is correct and I made an error in this article, which I’ll correct as soon as possible. So thank you for bringing this to my attention. However, there’s more to this subject as can be covered in this article. If you are curious, I suggest you consult Ernest W. Maglischio’s excellent book Swimming Fastest, which covers breaststroke swimming technique in detail.